When it comes to our sports, we live in a blue and red world. Blue and red. That’s all we see. Everywhere it’s either blue or red, and sometimes both. And I’m tired of it. It’s boring. Everyone in the sports world is just so busy trying to be like everyone else, and it’s maddening! Whatever happened to wanting to be unique? Why has it become so taboo to do something that sets your team distinctly apart from the rest? In the NFL 15 of the 32 teams use blue as their primary uniform color, five use red. Teams like the Minnesota Vikings in purple, the Green Bay Packers in green and yellow, and the New Orleans Saints’ black and gold stand out in a sea of blue. In Major League Baseball, 16 teams feature blue as their primary color (including the Padres), seven of them feature red. Only the Oakland A’s with their green and gold, the Colorado Rockies with their purple and black, and the Baltimore Orioles with their black and orange, truly contrast with the mundane uniform that typifies baseball. The National Hockey League isn’t much better, with 12 teams in blue and 10 teams in red (the Colorado Avalanche, despite the unique style of their jersey, still prominently features both colors). The NFL’s Denver Broncos used to have something special with their bright burnt orange jerseys, which apparently they’re trying to bring back, much to my joy. But here in San Diego, we had something else going on altogether. Something that no other professional sports team could claim, and only the University of Wyoming at the major college level. 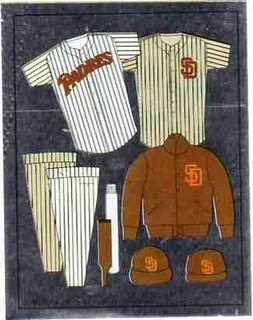 The San Diego Padres brown uniforms were unlike anything else in sports, and it was all ours. It set San Diego apart from everyone else. There was no way you could turn on a baseball game, see those uniforms, and not recognize the Padres. Some of those old uniforms were courageously daring, some classically stylish. Some Padres uniforms of the past should simply be burned and never seen again. But there has always been something about the brown that made the San Diego Padres pioneers of sorts. And I miss it. I was working for the club in 1993 when they decided to switch from the traditional brown to the blue, and I have to say I was more than a little disappointed. Looking back at those uniforms of the late 80’s and early 90’s maybe they weren’t the greatest uniforms of all time, but back then they didn’t seem so bad. Now, I know what you’re thinking: Brown is so ugly! It’s the color of…….well, we all know what it’s the color of. But that doesn’t mean it has to be bad. Take a look back at some of the original classics from the Padres’ PCL days and see how they worked. 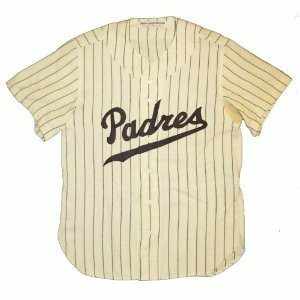 They were clean, classy, distinctive……perhaps they could update the “Padres” logo on the front, but I like it. It’s certainly unlike anything that currently exists in MLB. It screams “tradition,” which is really what baseball is all about anyway, so it’s perfect! Combine the classic jerseys with the brown hats and the gold interlocking “SD” and you’ve really got something sharp. At least they wouldn’t look like everyone else. After all, who can distinguish the current Padres uniforms from the Tampa Bay Rays, the Seattle Mariners, or the Milwaukee Brewers? How about a little variety to keep things interesting? Give credit to former Padres owner John Moores who wasn’t afraid to step outside the box a little bit, even if it was a pretty dismal failure. 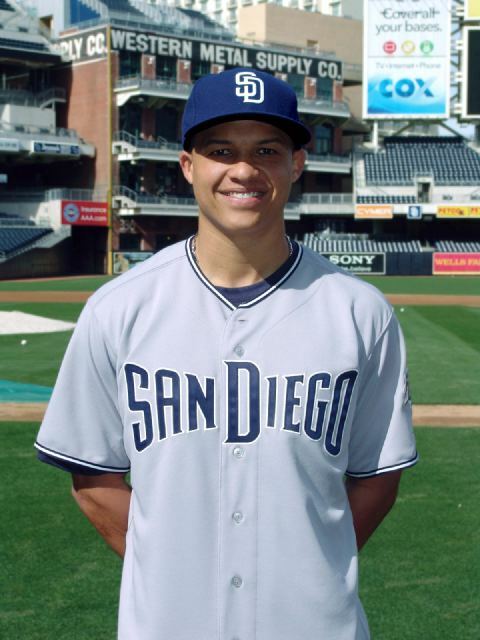 He tried something different with the team’s road uniforms in 2004 when they moved into Petco Park, switching from a gray color to “sand.” It was a nice try, but talk about ugly! Some Major League Baseball teams like to allow their players to choose which uniform combination they’re going to wear from game-to-game, and the Padres’ players more often than not chose to wear the blue tops on the road, which wasn’t bad with the sand colored pants. But the all sand……..yuck! Certainly they could have done better. They were an improvement on the bluish gray the team has changed to this year, though, which hardly looks any different than the Dodgers’ road unis. 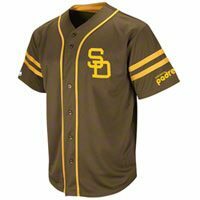 Still, there’s a pretty strong history of decent brown uniforms here in San Diego, and there’s no reason they can’t make it work again. There are of course plenty of arguments in support of the blue. After all, it is San Diego with the clear blue skies and the blue ocean. But by abandoning the brown, the club stepped away from its roots; the part of California history from where it drew its original identity. The very nickname “Padres” is derived from the Spanish missionaries–Father Junipero Serra in particular–who helped found Alta California for Spain beginning in 1769. 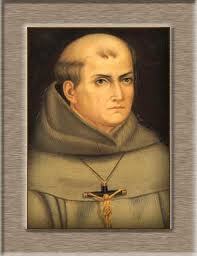 Father Serra established 21 missions in California, the first here in San Diego in what is now known as Mission Valley. He gradually moved north to Sonoma, establishing missions up the California coast along El Camino Real (now primarily known as Highway 101 up through the coastal valley). The traditional garb of the monks, or “friars,” (get it? Swinging Friars?) that the team was named after were the long, brown robes such as the ones characterized by “Robin Hood’s” Friar Tuck, and symbolized the vow of abject poverty the priests were required to take. In those days they were every bit as representative of a Catholic Priest in the Spanish New World as the modern day black shirt, black pants, and white collar that identifies the clergy today. Franciscan monks still wear similar robes today. It’s time for new Padres owner Jeff Moorad to make a bold statement and return the team to its beginnings. The color blue is heavily overdone in sports today, and doesn’t represent in any way where the team originally derived its name from. The name “Padres” is something unique to San Diego, much like the “Aztecs” of San Diego State. There is no other. San Diego deserves something different to go along with the name; something beautiful in its ugliness. Something as uncommon as their name. I may be in the minority here,but I like the blue and sand – then again, I hated the blue and orange years while they were around, but it seems the old pinstripes of the mid-90s are making a comeback, at least in fans’ wardrobes. Last year, I finally went out and bought a jersey from the sportswear guy at the ‘farmers’ market, making sure it was blank on the back so it wouldn’t be out of date in a year. Of course, I got ‘road sand’ – and now they’re back to road greys! I buy one hat a year, and for a long time it’s been the road cap – I liked the blue with the outlined gold SD – but last year switched it up and got the mid-old school brown with orange logo…that one’s holding up, so I’ll probably continue to rock it. Because it was windier than expected on opening day, Christina wanted to go into that sports shop a few blocks down from the stadium (which used to be cheap, but now isn’t much better than other places). For an early wedding present, she got me a brown and yellow windbreaker, so I showed up to the game in a hodge podge of outdated colors – road sand shirt, late ’80s cap, early ’80s jacket. Why is it that it seems we switch colors so much, anyway? Nationally recognized teams (think Yankees and BoSox) change their unis once every…never. On topic, I’d definitely support a change back to the old browns – whether it’s combined with the orange I grew up watching or the yellow that was a bit before my time but still sharp. And I’d like to see the Chargers back in their old powder blues more often – but not the new-school ‘alternates,’ those are ugly as sin. Both are unique, rather than the darker blue both teams sport now and, like Andy notes, are pretty generic in the sporting world. I had Season Tickets at Westgate Park, and took a .25 bus ride from College Grove Shopping Center while listening to Al Coupee and Jerry Gross to San Diego Stadium in the early days….. The Padre colors have consistently been voted the ” ugliest ” uniforms in ALL sport for years on end……nuf said. Brown definitely needs to reemerge, but just not with yellow or orange. Brown and white would look sharp. Brown tops with white lettering. Keep the blue for a second alternate but change the shade to deep powder blue like the “old school” Chargers with sand/gold lettering. Something similar to UCLA and their color scheme. Older Article: Let the Budget Wars Begin!